Ativan for Alcohol Withdrawal: Does it Work? Alcohol withdrawal is a common problem with an addiction. It can cause some health, socioeconomic, financial and legal problems. If you wish to give up alcoholism, you may consider using Ativan for alcohol withdrawal. It occurs as an aftereffect of chronic alcohol abuse. It is also called alcohol discontinuation syndrome. The symptoms develop when you suddenly stop or reduce the intake by a significant amount. Typically, they include minor anxiety and tremors. However, in other cases, they can be very severe and may cause convulsions or Delirium Tremens (DT). The latter is a potentially life-threatening complication. Death due to DT may occur in up to 5% of the patients who had it. Lorazepam, the active ingredient in Ativan, is a CNS depressant. It belongs to a class of medications which they call Benzodiazepines or only Benzos. It boosts the activity of a brain chemical GABA. As a result, you feel relaxed and away from abnormal worries. They do not recommend using it continuously for more than four months. Primarily, doctors prescribe it to treat anxiety which may occur alone or combined with depressive symptoms. Though the manufacturers do not promote Ativan as a treatment for alcohol withdrawal, your doctor may use if for the same. In all cases, make sure you follow your doctor’s instructions. That way, you can reduce the chance of an addiction problem, and also enhance its beneficial effects. 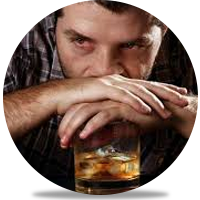 The main aim of an alcohol withdrawal therapy is to relieve the signs and symptoms. Once they are under control, the treatment shifts towards preventing the complications. For example, DT. You may need depressant medications like Ativan if your case is moderate or severe. Doctors are usually able to treat the mild cases with supportive treatments. They include proper nutrition and management of agitation. Benzos are the most valuable medications to treat alcohol withdrawal. They control anxiety and as well as seizures. In essence, they help the patients stay calm and peaceful. Additionally, they may also prevent complications. Studies suggest all the members of “Benzodiazepine” class are almost equally effective in treating alcohol withdrawal. Nevertheless, Ativan has certain unique characteristics. That’s why it may be superior to other Benzo medications. It is an intermediate-acting benzo. Interestingly, it does not transform into an active chemical even after some chemical changes inside your body. Because of this, it is safe for the patients who have liver diseases. Next, it has a lower potential to cause sedation and drop in the breathing rate. This unique property is particularly useful in alcohol withdrawal. It is because respiratory problems are common during the withdrawal. Additionally, it is safe and can produce desirable results with a lower dose. In fact, the duration of the therapy is also shorter when they use it. This is according to a 2014 study published in Alcohol and Alcoholism, Oxford Academic. Ativan significantly impairs the mental activity. It includes focus, attention, and ability to take an appropriate decision. This can be problematic especially during alcohol withdrawal counseling classes. You may experience serious symptoms if you drink alcohol while taking it. They include marked depression in respiration and mental ability. Both of which can be potentially fatal. Ultimately, the greatest fear with the use of Ativan to treat alcohol withdrawal is its risk of the addiction. Benzodiazepines are notorious for their addictive properties. Regrettably, it may occur even when you use it correctly. New studies also suggest the risk of Ativan addiction is higher in the patients who have a history of alcohol abuse. Ativan for alcohol withdrawal can be an option for you. It is always wise to discuss the possible treatment options with your doctor before you decide to start one. If you have a co-occurring mental illness, your doctor is more likely to prescribe Ativan. Follow the doctor’s instructions and ask if you have any questions. Make sure to get a balanced diet and other dietary supplements, if necessary. Chronic heavy alcohol use causes the deficiency of many essential vitamins and minerals. If you sense any trouble during the therapy with Ativan, seek a medical consultation right away. Want To Know More About Ativan For Alcohol Withdrawal? Talk to the experts to get authentic information about Alcohol withdrawal, Ativan or other treatment options, and treatment centers near you. Click here for more information. How long does alcohol stay in your system once you start the 4 day treatment with Ativan? My 22 year old son was prescribed ativan to help him detox from alcohol. He could go weeks without drinking, but had recently began again to help cope with feelings of depression. He had no anxiety, he was the most relaxed person you could ever meet. He was sober during the day, but occasionally at night he would drink, and have way too much. He was prescribed ativan June 29th 2018. We had a lovely weekend as a family. On July 2nd he swam with his siblings, helped us name our new puppy, read his baby sister all her bedtime stories, then kissed us goodnight. That was the last time we would ever see our son alive. He hung himself in the middle of the night. Please consider the risks of taking this powerful drug before you take it. My son would be with us today if he hadn’t taken it. Penny… words can not express my tears right now. My wife left me 3 months ago and i went through a suicidal as well as alcohol binge for a solid 2 months. I am finally getting myself on my feet now up here in good ol’ Vermont, but…… depression is no joke. I am so sorry for your loss. I am so, so sorry. i broke down for a solid 5 minutes when I read your reply. Please stay strong for yourself and your loved ones. I been in ativan 6 days now and actually been short and impatient with my wife but tired and get headaches. This is so freaking hard. I had a horrible mean abusive alcohol father. I have sworn for all my life, I would never be like him. I’m currently 55 and have been in denial myself for over 40 years. The last few years have been bad but the last few months have been horrific. I’m way too ugly, ashamed, embarrassed and depressed to talk about it with friends and family. With my dr. I’m considering African to deal with side effects. My question is, can I do this alone or do I really need someone to be with me.